When starting the DrumPerium Site my main focus was on Electronic Drums. In addition to that, I would add some news for Acoustic Drums and Drummers as well. First the DrumPerium Motto was “We’re ALL In On Drums!“, but after a while I decided to dedicate the site entirely to Electronic Drums and basically skip the Acoustic Drums completely. Mainly because there’s barely no sites (no good ones at least) who was 100% into Electronic Drums. New Roland Kit, All Good Right? As a result (to the lack of sites) It should be easier for me to attract this specific audience (Electronic Drummers). When decision was taken I quickly changed the DrumPerium Motto to “We’re ALL In On Electronic Drums!” instead. I must admit all lt good, I was confident this was the way to go and especially relevant as these (Electronic) Drums are the only ones I (can) use nowadays (due to impairment of hearing). 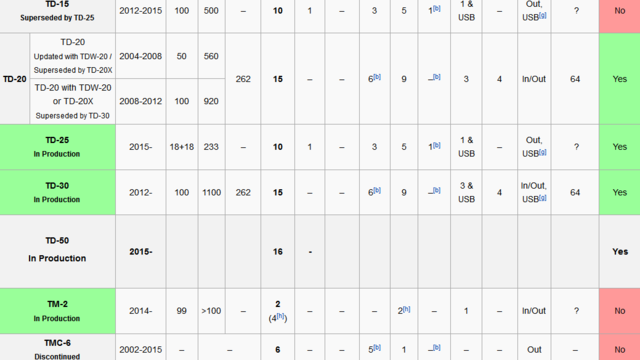 Now, about 8 months later, I realize why there are so few sites dedicated to Electronic Drums News & Reviews. It’s Because there barely aren’t any news to report or New Drum Kits to review. So like the header says, its easy to be wise in retrospect. 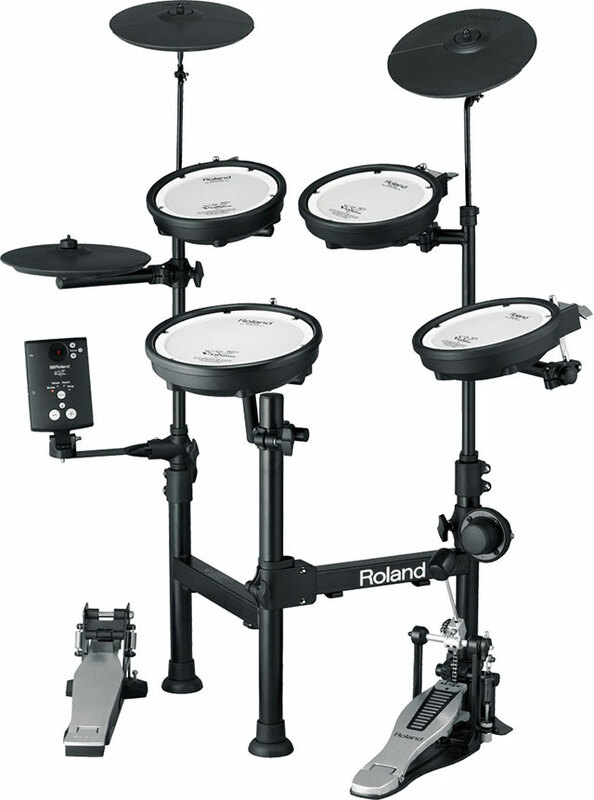 For example, I could have taken a look at the largest Electronic Drums Manufacturer Roland and their V-Drums Release Table (see image above) or a release table of any other Electronic Drums Manufacturer as it looks almost the same. There’s not enough things to write about, at least not for a site that need to be updated frequently in order to be interesting. So, now I’ve decided, AND this is my final decision 😉 , that DrumPerium will cover the Whole World Of Drumming. It means a Huge Variety of Drum News and Reviews. Covering anything from showing off a New Ludwig Snare to Gene Hoglands’ warm-up excersises before a gig. Yes, I confess when it comes to Drummer News, Drummer Lessons and Tips these will in most cases cover the Metal Genre. I think it’s best to write about things you like the most (in this case Metal) because the more knowledge you have about it. At least that’s my experience. So, Keep your eyes open for a “Make-Up” in the upcoming weeks and months. Keith McMillen Instruments (KMI) started a Kickstarter campaign for BopPad. Its goal of $35,000 was reached in just over 3 days. BopPad has a wide dynamic range and measures strike velocity from the softest hand drumming to the most hard-hitting drumsticks blasts. 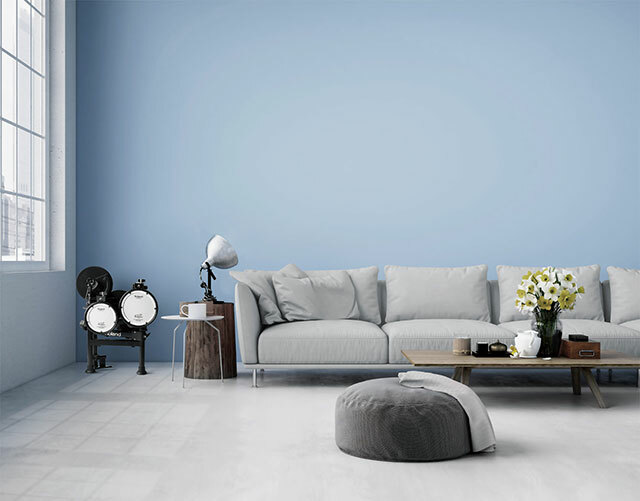 A robust tuned elastomer surface covers a 10” circle of a patented Smart Sensor Fabric to give you traditional feel and a new dimension of expressivity. The BopPad Editor software will be available as a desktop download and iOS app, but for ultimate accessibility they’re also developing a WebMIDI app so you can design presets for BopPad from a web browser. BopPad takes advantage of Smart Sensor Fabric Technology from BeBop Sensors, a leading supplier of fabric sensors & winner of the 2015 Frost & Sullivan Technology Innovation award. At the core of BopPad is a single large sensor made from the 8th generation of BeBop’s Smart Sensor fabric. BeBop develops sensors for OEM clients in Automotive, Sports & Fitness, Safety and Consumer Wellness. BopPad can also be used as a conventional practice pad with a realistic feel and portable, lightweight design. Currently, BopPad is available with early bird discounted pricing on Kickstarter set at $199. Why Settle Triggering Just Drums? Chang Demostrates It Well! With Lights, Camera, Triggers and Drums You Can Do A Lot! 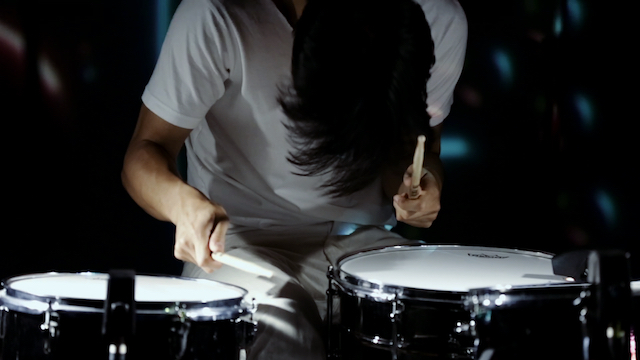 In a new video for the track “Spiritual Leader” Son Lux drummer Ian Chang puts drum fusion on full display. In this video he’s using Sunhouse’s Sensory Percussion Set, which not only allows him to trigger various samples, but also integrates each hit with lights and projections, creating a hypnotic, rhythm-based multimedia experience. Interview With Chang And All Describeb In Full at The Creators Project. While triggers turn your drum into little more than an on/off button, Sensory Percussion listens and reacts, responding to the essence of your performance. Sensory Percussion is a hardware + software system that is an overlay onto acoustic drums. The sensor clamps to the side of a drum (snare, tom or kick) and connects to our Mac/PC software via a standard audio interface as a phantom-powered microphone. 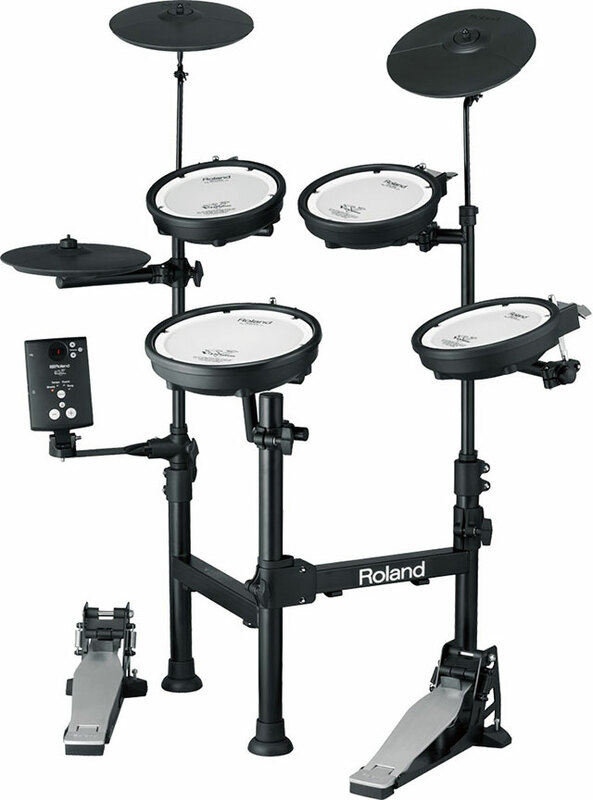 The Roland TD-1KPX is the latest addition to the portable V-Drums line. Despite its small footprint and weighing far less than other drum kits, the TD-1KPX features a sturdy drum stand for rock-solid performance. Also, it features Roland‘s famous mesh-head V-Pads for snare and toms. The innovative folding design allows the stand to be packed down in seconds for easy transport or storage, without needing to remove the pads and cymbals. Set up is ultra-easy, allowing the TD-1KPX to be played anywhere: home, live gig, or rehearsal studio. Simply add an acoustic kick pedal or V-Drums kick trigger pedal* and get playing! *Kick pedal not supplied; optional kick trigger pedal available. 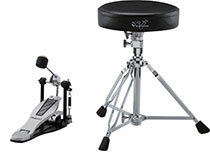 The TD-1KPX’s innovative folding stand is durable, sturdy, and ultra-easy to set up. All you need is a dedicated drum tuning key and you’re ready to play in seconds. Simply unfold everything, adjust the stand and pad positions, attach an acoustic kick pedal (not supplied), and start drumming. When you’ve finished your practice session or gig, the stand folds down quickly into a surprisingly condensed size for transport. Or stowing away at home in a corner, under a table, or in a closet. The folding stand can adapt to fit many spaces and situations. Making the TD-1KPX a kit you can truly play anywhere. The 8-inch PDX-8 and 6.5-inch PDX-6 mesh-head V-Pads feature Roland’s amazing dual-triggering technology, resulting in accurate and even sensing between the head and rim. 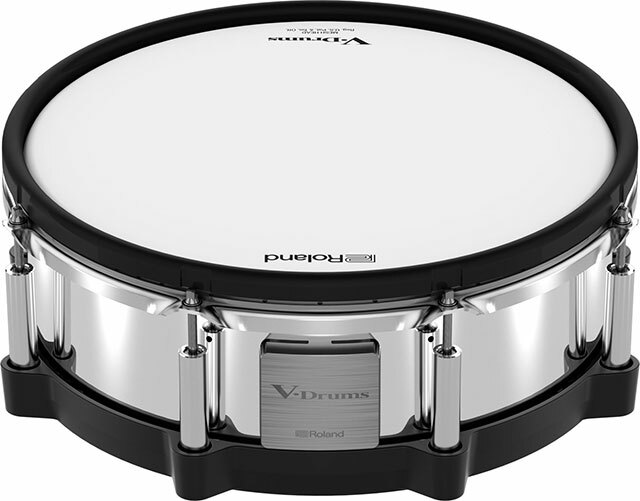 On the PDX-8 snare pad, the rim area expands the pad diameter to 10 inches, allowing for comfortable and quiet rim-shots. CY-5 cymbal pads are included for cymbals and hi-hat. These provide 10-inch playing surfaces and swinging movement for more drummer-friendly triggering and great playing feel. The cymbals also have separate bow and edge triggering for a true-to-life playing experience. The hi-hats offer smooth tonal transitions from open to closed with subtle tonal changes. Built into the TD-1KPX module is a wealth of enjoyable functions to encourage learning. No matter whether you’re teaching yourself to play, studying regularly with an instructor, or simply wanting to keep your skills in shape. Think of this kit as your own live-in drum teacher and personal backing band. Packed with tutorial features that develop technique, boost motivation, and help you get the most out of practice time. Play along with the onboard metronome to tighten your timing and use Coach mode to build and maintain speed, stamina, and accuracy. Get ready for your gigs or band rehearsals by jamming with the internal songs in the sound module. Or connect a smartphone or music player via the Mix In jack and drum along with your favourite tunes. With the onboard recording function, you’ll get instant feedback on your progress. The TD-1KPX is not just fun to play by itself. It’s also a great way to make music with your computer. Maybe you’ll transfer your playing into your computer-based recording software, capturing a live drum feel in your latest masterpiece. 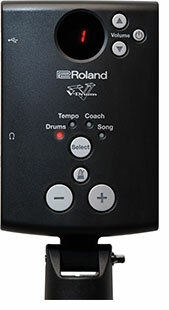 Or perhaps you’ll use Roland’s free V-Drums Friend Jam series applications. It offer jam tracks, practice features, and the ability to compete with V-Drums users across the planet. Whatever application you choose, the TD-1KPX is a drum kit that lets you go places. Replace your acoustic kick pedal with an optional KT-9 or KT-10 Kick Trigger Pedal to drum quietly without annoying your neighbours. The innovative designs of the KT-9 and KT-10 mean that authentic pedal feel and playing technique can be retained while minimizing the noise and vibration associated with regular kick pads. And by using two KT-10 pedals, it’s even possible to emulate a double bass drum setup. Meanwhile, the included FD-9 Hi-Hat Control Pedal is super-quiet. In combination with the quiet mesh-head pads, the TD-1KPX could make for the quietest drum practice setup you’ve ever had. 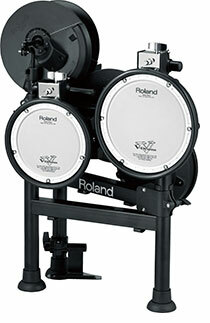 A wide selection of accessories and options are available to enhance the Roland TD-1KPX playing experience. The PM-10 Personal Monitor Amplifier is the perfect companion for amplifying your drums in the home. For beginning drummers, the DAP-3X V-Drums Accessory Package provides everything needed to get playing the TD-1KPX. It includes a pair of hickory drumsticks, an acoustic kick pedal, and a drum throne. Specially designed for portable V-Drums, the TDM-3 Drum Mat helps reduce vibration through the floor when playing and protects floor surfaces against damage. The CB-TDP Carrying Case offers a convenient way to transport and protect the TD-1KPX. Portable V-Drums – A compact and lightweight drum set that can be played anywhere. Innovative folding design – Packs down without the need to remove pads or cymbals. Mesh heads included – Roland’s famous mesh-head V-Pads for snare and all toms provide great playing feel and natural response. Easy to use – TD-1 sound module includes carefully chosen high-quality sounds, metronome, Coach functions, and play-along songs. Customize with accessories – Dedicated carry case to transport the drums (including all pads and pedals), quiet kick trigger pedals, and more. 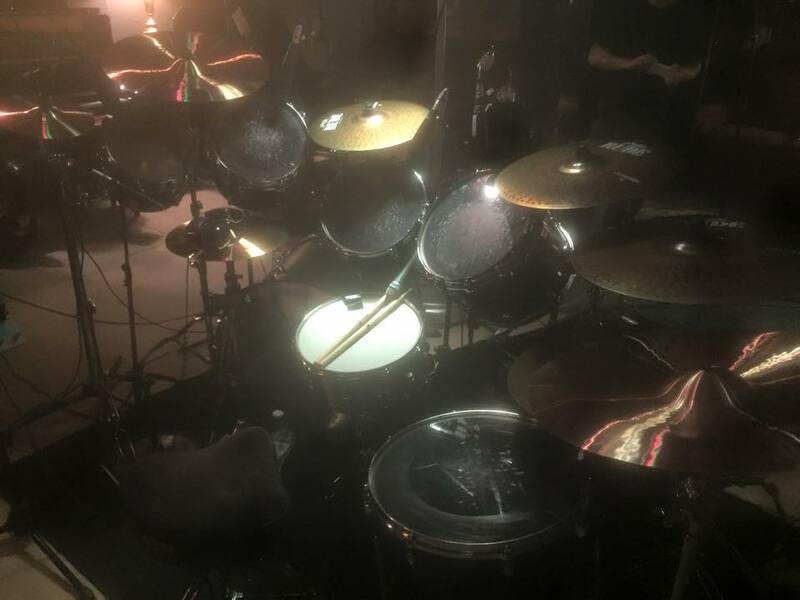 Kit Configuration*: Kick Pad, Snare (PDX-8), Hi-Hat (CY-5), Hi-Hat Pedal (FD-9), Tom x 3 (PDX-6), Crash (CY-5), Ride (CY-5), Drum Stand (MDS-TDKP1). Display: 7 segments, 3 characters (LED). Module Features: 15 Drum Kits, 15 Songs, Metronome and Coach Functions. Connectors: OUTPUT/PHONES jack, MIX IN jack, USB COMPUTER port, TRIGGER INPUT connector. 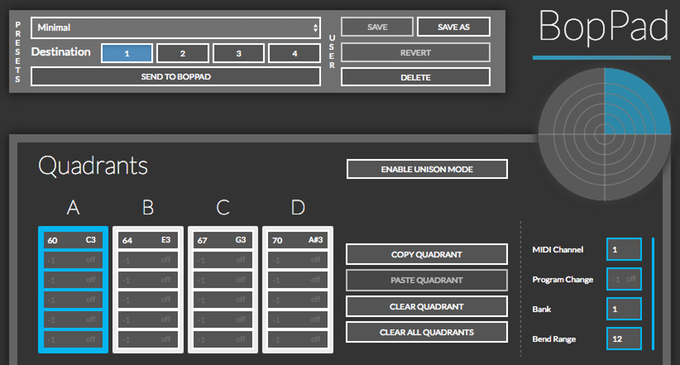 Interface: USB MIDI (Transmitting only). Accessories: Setup Guide, Owner’s Manual, Special connection cable. Width: 100 cm (39-3/8 inches). Depth: 120 cm (47-1/4 inches). Height: 125 cm (49-1/4 inches). Width (Folded): 41,5 cm (16-3/8 inches). Depth (Folded): 61 cm (24-1/16 inches). Height (Folded): 75 cm (29-1/16 inches). 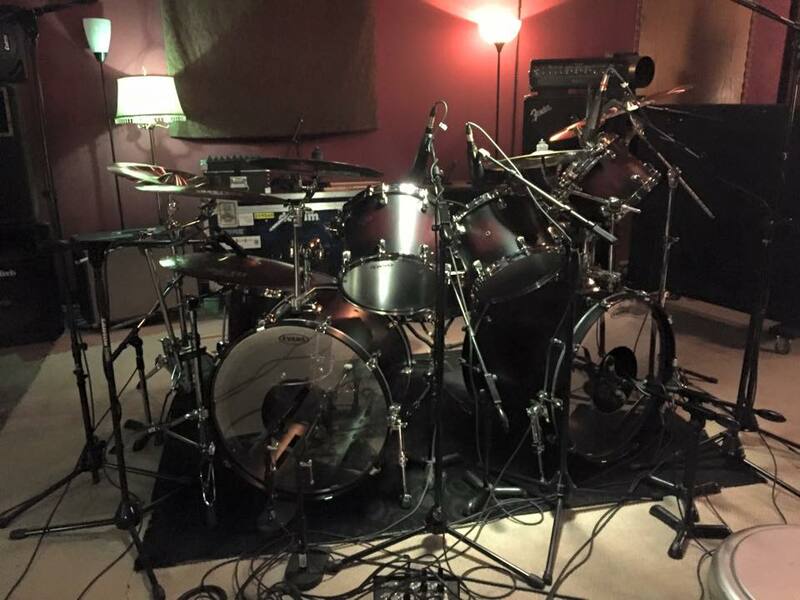 Dave Lombardo In The Studio Recording For… Who? Dave Lombardo has recently been busy touring with punk/metal crossover thrashers Suicidal Tendencies. He tracked drums for their 2016 release titled World Gone Mad, so he’s in good shape to tackle the punk assault of Misfits. Dave Are Currently In The Studio Recording An New Album For? Well, We’re Not Sure. Hopefully For Thrash, Speed or Death Metal Band Where He Can Show Off His Full Potential and fits Like a Glove! Suicidal Tendencies are booked to play Ozzfest Meets Knotfest on September 24-25. Dave Lombardo will therefore share the festival bill with his former bandmates in Slayer. The drummer’s most recent 12-year stint with Slayer ended in 2013 amid an acrimonious dispute about pay rates. Three years have passed by since and man do we miss him! No one other than Dave Lombardo can handle the Slayer drum throne other him, Period!, NOT EVEN Close! 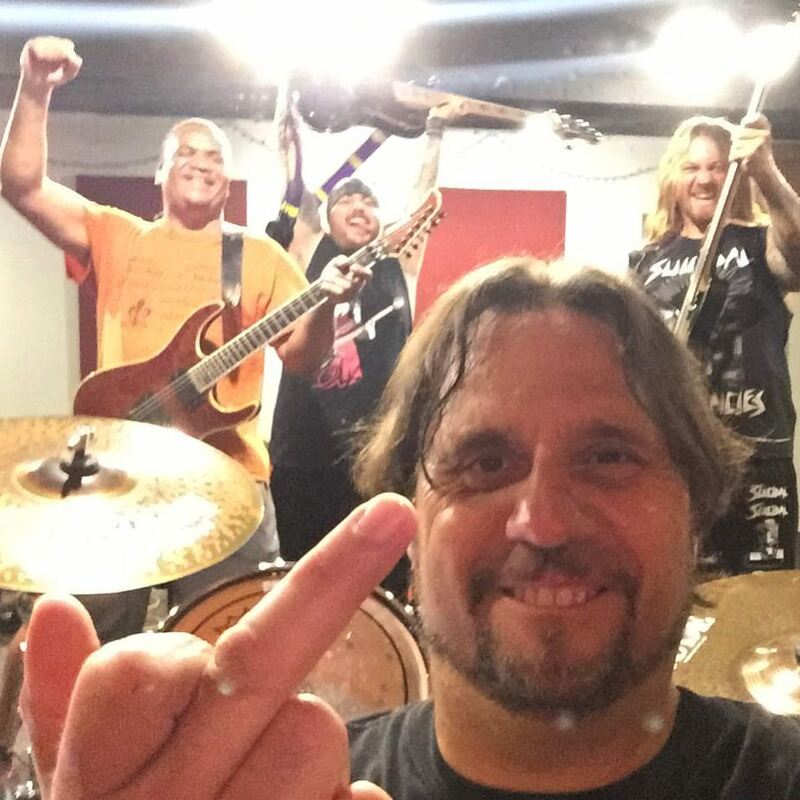 So how come we’re so excited about Dave Lombardo being in the studio again? Because we know his studio time is not for Suicidal Tendencies, as their album has already been recorded. It’s probably not Dead Cross, considering that album seems like it’s all wrapped up. Perhaps Lombardo is recording a new Misfits album? Remember Dave were a part of the Misfits Reunion, alongside original vocalist Glenn Danzig, for Riot Fest earlier this year. In fact the lineup said they’d love to do a record together at some point as well. Is He Recording Drums For A Thrash Metal Band? So, although I wish he would be recording with Slayer (which would never happen) or any other Thrash Metal band. It seems like Misfits is the best guess now. In The Meantime lets enjoy and celebtrate the good old times by ending with a Dave Lombardo Drum Solo. Roland continues to revolutionize electronic drums, and the newly developed digital trigger pad Roland PD-140DS is no exception. This innovative Snare Pad work directly with the powerful processing in the flagship TD-50 sound module. By incorporating the very latest technologies, never before have electronic drums been so true to life. 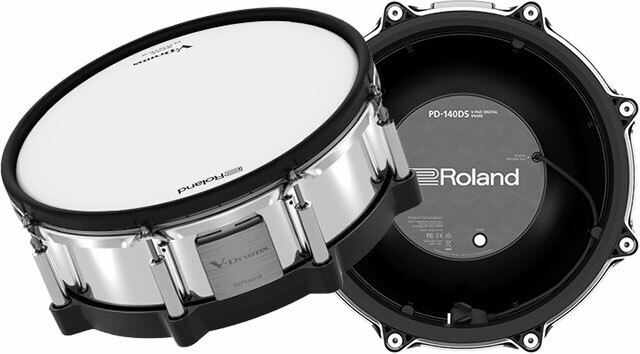 The Roland PD-140DS V-Pad combines snare tradition with highly advanced triggering and exceptional sensitivity. A Sensitivity which is communicated to the TD-50 drum module via a high-speed digital connection. A brand-new, three-layer Mesh Head is fitted to a standard 14-inch Shell, providing natural rebound and feel that’s instantly familiar to play. Due to Roland‘s new multi-element sensor system, your strokes across every area of the pad are more closely detected than ever before. 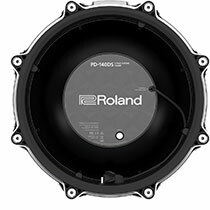 The playing dynamics of Roland PD-140DS Snare Pad are captured in minute detail. Head Shot (High resolution positional detection, Wide dynamic range). Rim shot (Depth detection, Wide dynamic range). In addition, traditional cross stick technique is automatically detected as the pad senses your hand position and consequently adjusts accordingly. 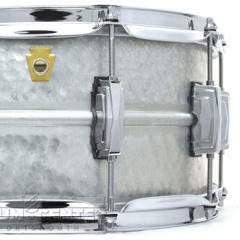 Producing snare sounds that are natural, detailed, and bursting with character. The Roland PD-140DS delivers all-new levels of performance and playability. Roland PD-140DS Snare V-Pad ships with Owner’s manual, Connection cable and a Drum key. High-resolution sound triggering with accurate positional detection. Designed for use with the flagship TD-50 sound module. Play cross sticks using traditional techniques, with no need to adjust settings inside the module. Three-ply mesh head provides natural rebound, playing feel, and response. Standard acoustic-style 14-inch diameter offers a familiar look, presence, and playability. Reflective steel shell makes a visual impression on the stage. Drum Pad size: 14 inches. Drum Shell depth: 4.3 inches. Drum Head: 3-ply mesh head (Floating mid-layer structure). Multi element sensor system: Head sensor, 3 Position sensors, Rim sensor, 3 Cross-stick sensors and 3 Built-in sensing processor. Supported covering size: 98 (width) x 1,060 (length) mm. Thickness: 1 mm or less. Connector: DIGITAL TRIGGER OUT plug compatible with Roland drum sound module equipped with DIGITAL TRIGGER IN port. Power supply: Supplied from DIGITAL TRIGGER IN port (DC 5 V). Width: 380 mm (15 inches). Depth: 380 mm (15 inches). Height: 160 mm (6-5/16 inches). Weight: 4.9 kg (10 lbs. 13 oz. ).